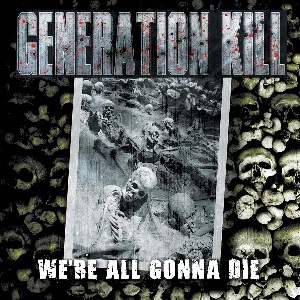 New York City thrashers GENERATION KILL have revealed the artwork & track listing for We’re All Gonna Die, the band’s second studio album and debut album on Nuclear Blast, to be released on November 18th. "We achieved our goal of creating something that we all are so proud of”, states GENERATION KILL frontman & lyricist Rob Dukes, who also fronts the Bay Area thrash band EXODUS. “We called this album We're All Gonna Die because for the most part the lyrics are about the darker side of the existence of humans on this planet. The album as a whole is so diverse, drawing from our influences that we grew up on. I personally think this is the strongest vocal performance of my career, and as a band, we can't wait for the hard rock/metal world to hear this album." The album was produced by Zeuss (HATEBREED, AGNOSTIC FRONT, MUNICIPAL WASTE) and Rob is joined by fellow GENERATION KILL band members Rob Moschetti (ex-PRO-PAIN / M.O.D.) on bass & backing vocals, Jason Trenzcer (ex-MUTILATION) & Jason Velez on guitars and James DeMaria (ex- MERAUDER) on drums. The GENERATION KILL band name comes from the title of the 2004 book (also an HBO mini-series) written by Rolling Stone journalist Evan Wright.